Postural Respiration – Lima, OH (pronounced “Lie-ma”, like the bean). The course was hosted by Lima Memorial Wellness Center, inside the bright and spacious YMCA. We had clinicians from a range of fields (PT, PTA, OT, ATC, student, exercise physiologist, and chiropractor) and experience (from first course to twelfth). A good deal of time was dedicated to lab, where attendees gained solid familiarity on how to inhibit over-active chains of muscle through both manual and non-manual techniques. 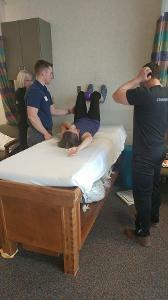 It was helpful to have seasoned PRI course-goers stepping in to offer their clinical pearls (Alex Maag, DPT, PRC; Mary Ann Arellano, PTA; Chris Fortman, PT; Melissa Miller, PTA; and Beth Trombley, DPT). Attendees learned the value of blowing up a balloon and filling a left posterior mediastinum and the meaning behind synchronize and separate to achieve optimal gait mechanics through obtaining, and maintaining, a L ZOA. Thank you to our models John Hollenbacher, OTR/L and Lisa Overman, PTA, who kindly allowed us to evaluate their patterned bodies and who gamely performed non-manual techniques that would challenge any Olympian! Thank you also to our reader, Nancy Siatkosky, DPT, who was nearly flawless (good thing everyone was paying attention and didn't try releasing the subclavius with their derrier!). Many thanks to Alex Maag for fulfilling many roles, from lab assistant and A-V tech support to keeping this instructor well-fed, and to all of the clinicians of Lima Memorial Hospital: Ronnie Ballard, PTA; Cassie Frantz, DPT; Richard Garber, ATC; Mary Jump, PTA; Melissa Miller; Lena Moore, PTA; Nancy Siatkosky; Casey Siefker, PT; Jennifer Smith, PT; and Desiree Wallace, PTA. As someone who has hosted courses in the past, I know the effort that is put forth to make everyone comfortable – including the extra coffee on an oh-so-early Sunday morning😊 your hospitality was superb!